GSMArena team, 12 December 2017. 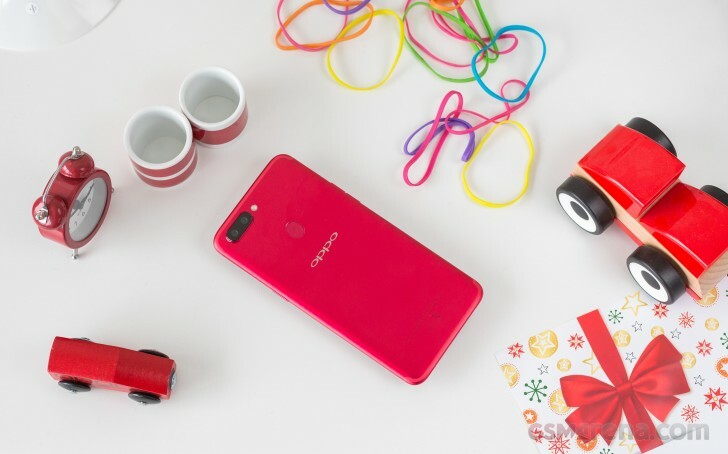 The Oppo R11s comes in a well-stuffed box. The proprietary 20W VOOC charger is paired with a VOOC-compatible microUSB cable, there's a nice pair of earbuds and even a transparent soft case. The R11s also comes with a factory-applied screen protector, which we removed trusting Gorilla Glass 5 to keep the screen safe. 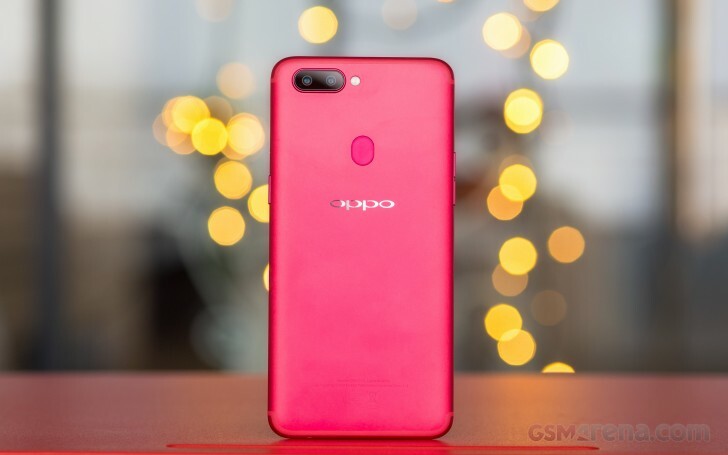 The Oppo R11s measures 155.1 x 75.5 x 7.1mm, which is about the same as the Oppo R11 and yet it manages to fit a bigger 6" display and a larger battery. The S models weighs 153g, just 3g more than the regular R11. 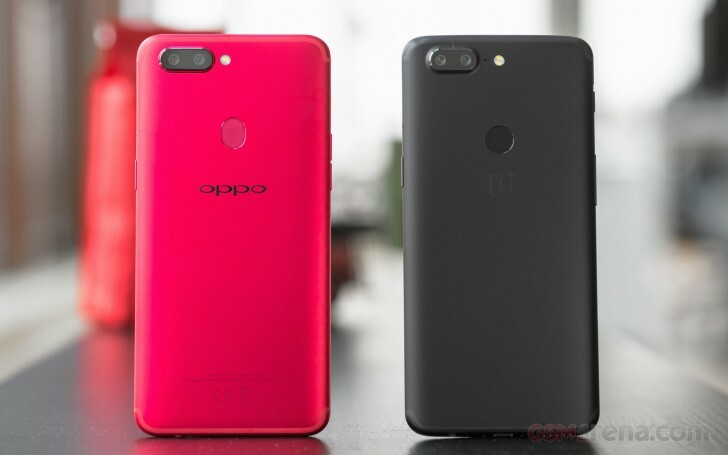 Oppo had just a few months to smarten up the R11 and a dramatic re-design was out of the question. The R11s keeps the metal unibody of the regular R11, including the less intrusive antenna lines. But it's the addition of an immersive widescreen that is the real game-changer. The 18:9 display has become a must-have feature, and the makers are rushing to refresh their lineups. Once exclusive to flagships, widescreen is now at the heart of the new generation of midrange smartphones. 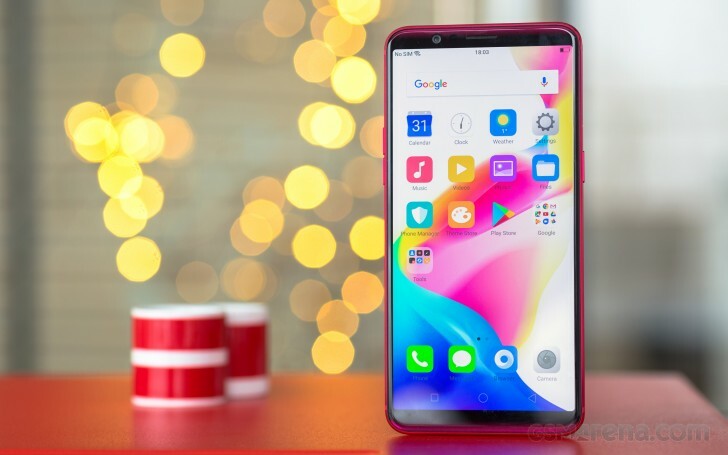 Just like LG and Vivo, Oppo pretty much retrofitted the new screen into the existing metal chassis. And the result looks good - there's more screen now, and less bezel. 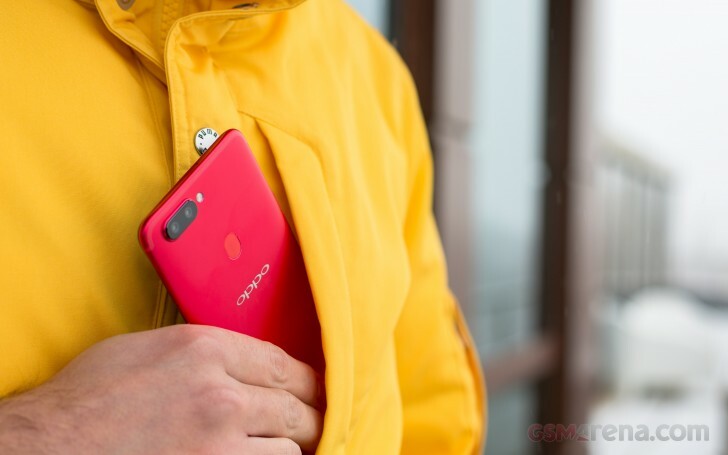 Oppo has given the red model some special treatment with some beautifully varying shades of the main color that make the chin and the top seem even slimmer than they actually are. They call that design accent Starry sky and even though it's in a way reminiscent of how phones in the past were styled, it gives the phone much-needed character. The metal unibody has seen some minor tweaks too. The sides are a little sharper, which actually improves the grip and makes the handset look even slimmer. The top and bottom have been subtly carved out, which may not have any impact on usability but sure adds some style points. The Oppo R11s looks stunning at the rear, the ever subtle antenna lines painted quite nicely. The brushed aluminum is very pleasant to the touch, regardless of the paintjob. The fingerprint scanner has been moved around to the back, it's always-on and impressively fast. The one thing we are not so happy with is the protruding camera. It's quite a bulge - a double layer made up of the metal rim and the glass covering the lens. If you rest the R11s on a flat surface it will wobble every time you touch the screen. We guess that's the price to pay for the slim profile and stunning looks. 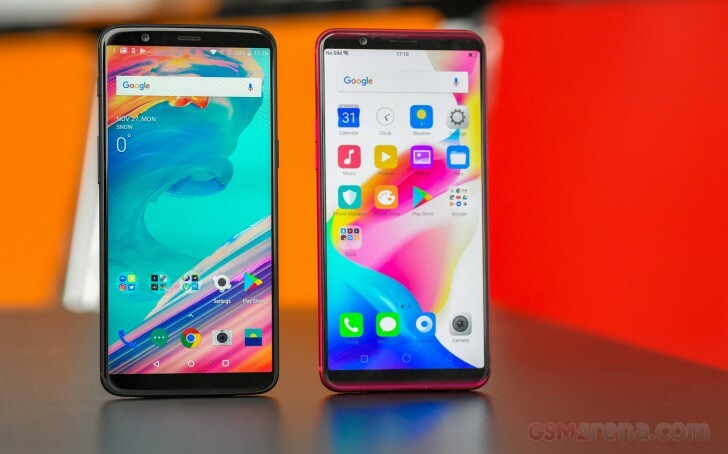 Finally, it's a poorly kept secret that Oppo and OnePlus are owned by the same parent company and their phones share a lot of similarities. Just like the OnePlus 5 and R11 before, the 5T and the R11s share bits and pieces too: similar screens, bodies, cameras, fast charging technology. And we just couldn't pass the opportunity to snap those two next to each other. They are by no means competitors, not because they probably come from the same factory but because they are intended for different markets. Handling the Oppo R11s feels as good as handling a flagship smartphone. 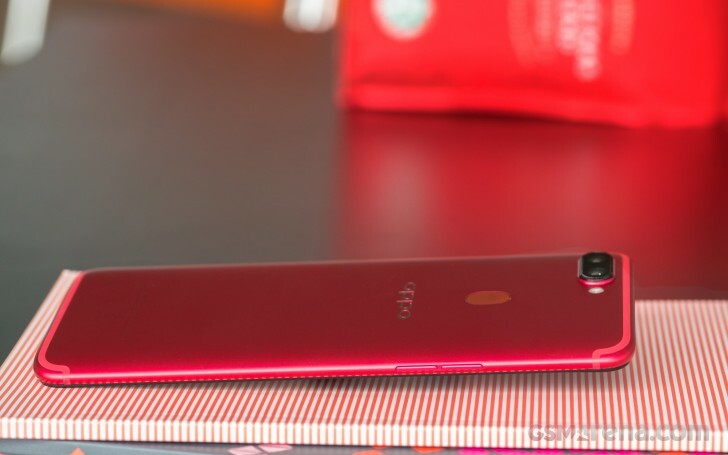 The slim phone feels extra solid and secure to hold and the build quality is uncompromised. It's not a phone made for one-handed use as it's quite wide and tall but it does offer an immersive experience. 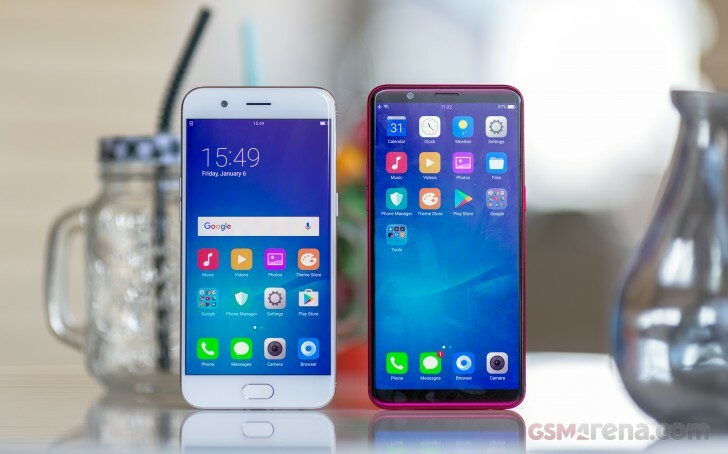 The Oppo R11s has a very clean front now that the hardware keys have been retired. The earpiece and the selfie camera are the only things of interest above the screen. A couple of sensors and a notification LED are around, pretty much out of sight though. The volume keys are on the left of the R11s; the secondary mic is at the top; the power button and the hybrid SIM slot are on the right. The bottom looks rather crowded with the micro USB port, the mouthpiece, the loudspeaker grille, the audio jack, and two screws. And while we're on the topic, Oppo, what's up with that micro USB port, can we all finally make the move to USB-C? The dual-camera setup on the back is sticking out quite a bit, there's the metal rim topped with the protective glass. The LED flash and the always-on fingerprint scanner are around.